Fill the grid with given set of digit. Additionally, exactly two squares in each row and column should be blackened. 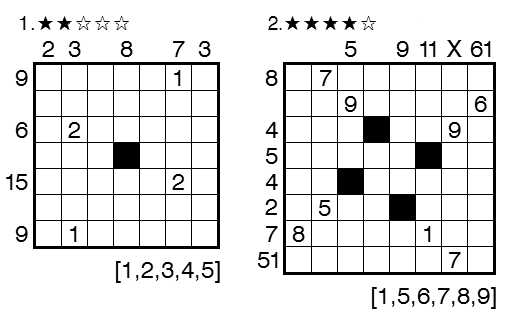 The number between the blackened squares must be multiple of number outside the grid in the corresponding row/column. The number should be read top to bottom or left to right. Black cells should be adjacent when X is placed in that row/column. This is the variation of Smashed-Sums(*1)(*2) I developed. In this puzzle, following fact is important. Multiple of 5 : The last one digit is 0 or 5. Of course, multiple of 15 has the property of multiple of 5 and 3. (Updated) Original inventor of Smashed-sums in JPC 15th is unknown. Naoki Inaba reinvented the puzzle in 2008 indipendently. (*1) ビトゥイーン・サム, 第15回全日本パズル選手権インターネット予選, 問題 20 (2006). 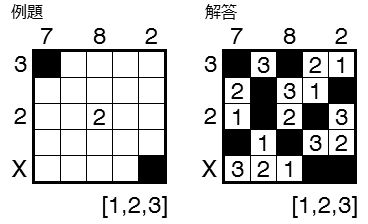 (*1) Between Sum, 15th JPC, Puzzle 20 (2006). 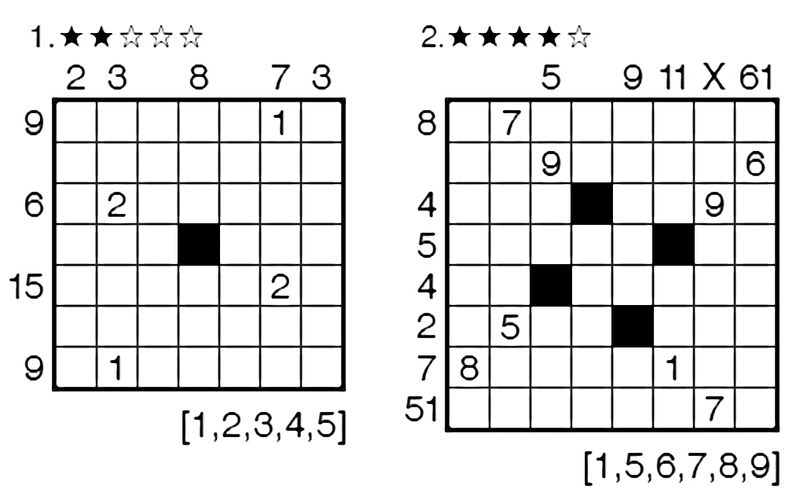 (*2) Same rule puzzles by Inaba(Hasamu-Sum). Here is detailed information by Serkan Yurekli.